We’d love your help. Let us know what’s wrong with this preview of Why? by Richard Torrey. To ask other readers questions about Why?, please sign up. Be the first to ask a question about Why? Children always ask question after question, and the same goes for the young boy in this book. Although there is never always an answer, the questions will still be there. The illustrations are great, and show the text very well. 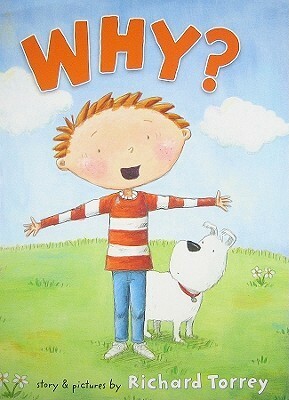 A cute book for children that just keep wondering "why?". My son still quotes this book half a year after reading it: "Why is it always your turn?" "Why is it always my turn?" and "why do they put holes in the crackers?" So we had to get it from the library for a 2nd time. Very amusing book for a 5 year old! This book was really interesting since it was full of questions. Although I only gave it 2 stars, I did like some parts of it. I think that this book did a good job of depicting a child since all they do is ask questions. I know that once I become a teacher, students will constantly ask questions and expect me to have all the answers. I think this would be a good book to read to the kids and see whether they agree or answer the questions that the little boy asks. The book of ,"WHY" , every childs questions and the ultimate phase. Children are always filled with questions and full of wonder. This book celebrates that with a series of fairly common questions that a young five-year-old would ask. We discovered this book after reading Because by the same author. That book offers a lot of answers to many of the same questions and it would be fun to read these books together. We enjoyed reading this book together and will look for another book by Richard Torrey, Almost at our local library next. Jack is the main character in the book. The entire book is about him asking all his questions with "why". Although it has only one sentence per page the pictures is very expressive. In addition, he starts all his questions with "why". I like the book because it shows this child being naturally curious. This is something that all children can connect with. In addition, it is reinforces the use of the exclamation mark. 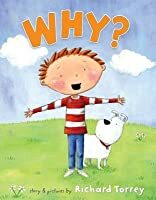 This book is about the "why" questions that children ask. On some of the pages, the students will have to predict what the answer to the questions are. The students can take a picture walk of the book and learn about the emotions the boy experiences throughout the book. There is not a ton of text in this book, so it would be a good book for beginning readers. The illustrations make it fairly easy to predict the outcome and emotions in this book. Probably most appropriate for a preschooler or picture reader. Mostly just a picture with a cute why question. My favorite was the two page spread. One side with older brother holding the remote and the question "Why is it always your turn?". The other side the brother holding out the trash and the question "Why is it always my turn?" Kids ask this question, it's true. But I didn't see any deeper insights offered, in art or text. It did bring up relations with older siblings and death of pet issues, but on a fairly superficial level. I hate to be so critical. I still give much credit to the author/ illustrator. I know how much effort goes into creating the text and illustration for a book! I have known children that are incessant "Why? "-ers and this would be a book to bounce off those little inquisitors. The parents in the book take a rather passive stance. The older brother shows some personality and it could be a sounding board about sibling issues. 'Why?' is the book with all different questions. The boy are curious about all different things. This will be a fun book to read to the young students how are curious about all kind of things happen in their life and ask all different questions. This is a great book foe six year old and younger. the book is about a six year old boy who is full of why questions. This is a great book for science when teaching students that they already inquire about the world like a scientist. Jack can't help but ask questions about everything around him. Cute book about how a little boy asks LOTS of questions. I loved the illustrations. This is an earnest little picture book that doesn't quite measure up to its potential. Why? Good question. Could be an interesting writing prompt - what makes you wonder "why?" Big illustrations and one sentence per page make this nice for early readers and listeners. This was a cute book about a kid who has questions about everything...but no one ever answered his questions. If the end had been a bit more satisfactory, I'd have given it 5 stars. Everyone who is a parent will recognize little Jack's inquisitive nature as part of growing up. This book reminds me of when I baby sit young kids who are in a why stage. They are always asking questions. Each page has a different question.